Import HDPE and LLDPE prices to Southeast Asian markets are currently trading at or close to their highest premiums over China for the past one year, according to data from ChemOrbis Price Index. The disappointing agricultural film season in China along with new coal based capacities were cited among the main reasons for the wider gap between prices in the two regions. 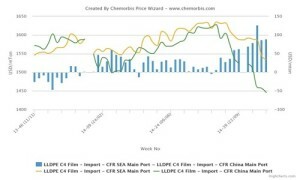 In the HDPE market, import prices on a CFR SEA basis are currently trading at their highest premium over CFR China for the past year at around $50-70/ton while the premium has been steadily rising for the last three weeks. “Material from a new coal based producer recently started entering the market in China, while a few other producers are also set to begin production at new coal based facilities soon. This fact, along with lackluster demand and the fact that many traders are struggling with cash flow issues, is keeping prices under downward pressure,” a trader based in Shanghai stated. According to ChemOrbis, in production news, Ningxia Baofeng Energy was due to start up its new 300,000 tons/year HDPE/LLDPE swing plant in October while Pucheng Clean Energy Chemical is due to start test runs at a new 300,000 tons/year PE plant in mid-November. In addition, Zhongmei was reportedly planning to start up a new 300,000 tons/year coal based LDPE plant in September. Will European PS sellers achieve rollovers in November?